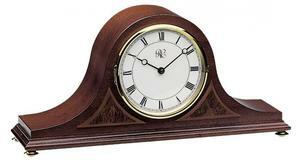 The Walnut Tambour Mantel Clock is a beautiful piece to add to your favorite room in your home. It also is a great addition to any office desk. An alarm clock and digital clock are nice, but there is nothing quite like a beautifully crafted mantel clock. This mantel clock from River City clocks will be sure to provide years of use for you and your family.